It’s no secret that Drago Centro is one of my favorite places to drink and eat. And then drink, again. 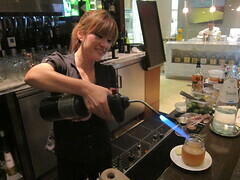 But it just wouldn’t be the same without Jaymee Mandeville at the helm of each seasonal cocktail menu. And the latest is a doozy. It’s inspirational with each cocktail proving their point of view and collectively, it’s her strongest menu yet. Though there’s diversity, each drink is well-balanced, with many even evolving through the end of each sip. I’ve made some notes, with a pictorial at the bottom to aid you. So get thee to Drago Centro. Daniel and I practically named this the Zahra Bates cocktail (the former bar manager of Providence was with us as we sipped through the menu). It had just the right amount of bubbles, yet was still festive, with the Oxley gin providing just the right amount of weight. The tea foam was made from a Chinese white tea, which made it extra elegant and lightweight. This fantastic vodka cocktail was deceivingly tart, but was well-balanced with the allspice dram. Usually, the “holiday” in winter cocktails are relegated to whisky bases, but this was extra tasty and held its own. The rye shrub cocktail of the year. So good! A contender for my favorite. The shrub made with Concord grapes was just sweet enough to complement but not overpower the rye. It’s no secret that I love St. George everything Terroir Gin, and the such-infused kiwi cuts at the bottom of the glass are really the icing on the cake. The Dolin, lemon and Absinthe finish just made this the best aromatic choice on the menu. Perhaps I lied, because this one could’ve been my favorite. Just don’t ask me to choose. This is basically a Cynar-lover’s dream. Loved that blended Scotch was used to really carry out that artichokiness (well, it’s a word, now). Love beets? Love savory? This is your drink. Jaymee loves to put an extra-savory rendition of the Bloody Mary on her menu – and this is done well with an unexpected spin on beet juice. If you have a bunch of friends who are still questionable – or even just downright hate – on mezcal (and we all do), you may just want to buy a round of these for them. Even the ladies, thanks to the elegant, wide bowled Marie Antoinette glass. 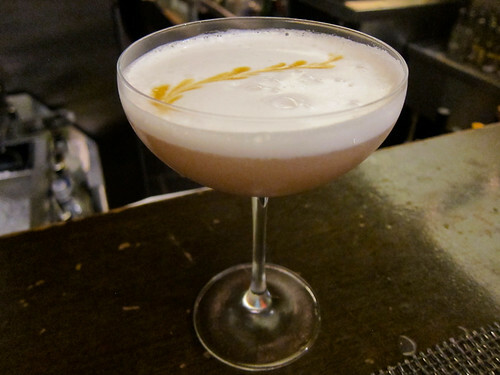 This is the egg white cocktail on the menu, and it’s so delicious while still paying homage to its smoky properties. For those who love chocolate – or at least smelling chocolate – this is your snifter. Inhale before and as you sip – it’s an experience in itself. And who isn’t sipping cachaça, these days? Okay, this is the other aromatic choice on the menu – but it’s also juicy with a ton of flavor. Love Nolet’s! The best hot toddy! And with tequila. I love that Jaymee kept the brown butter in a foam on top, which made the spirits hold their weight in the cocktail. This entry was posted in cocktails, Downtown LA and tagged @dragocentro, cocktails, Downtown LA, downtown los angeles, Drago Centro, drinks, DTLA, Jaymee Mandeville, L.A., seasonal, winter. Bookmark the permalink.